Autumn is here and leaves are now displaying their beautiful colours. 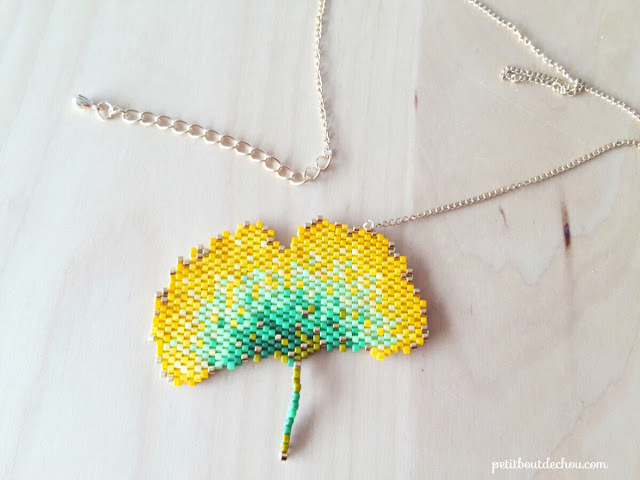 The ginko tree has amazingly shaped leaves that I could not resist turning into a beadwork. 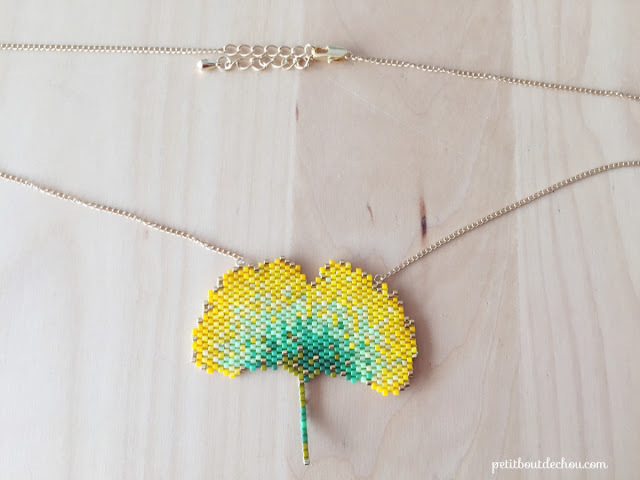 This necklace is made with Miyuki delica beads using the brick stitch technique that I will describe for you below. This post was first published on perlesandco.com. You can find the French version here. Cut about 2 m of beading thread. Then, thread each end in one needle. Please find below the grids of the ginko leaf I have prepared. 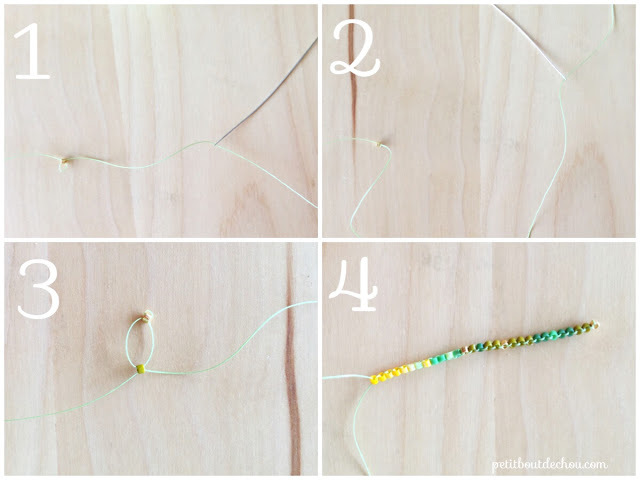 For the first row, following the grid, string on the first bead using one needle and go through it using the second needle (1) and pull it up (2). 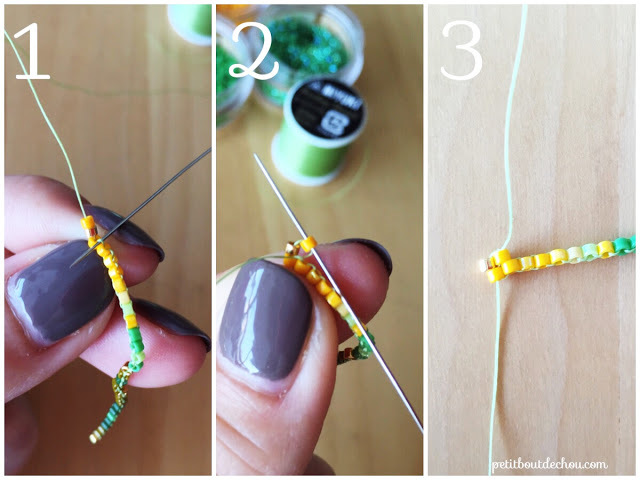 Repeat these steps for the second bead on your pattern(3). 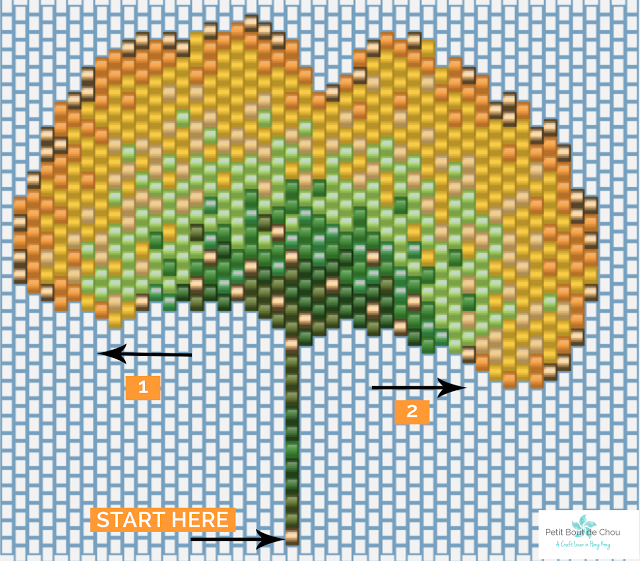 Repeat until you have done all the beads of your first row (4). The second row start with a simple increase (1 more bead on the row). 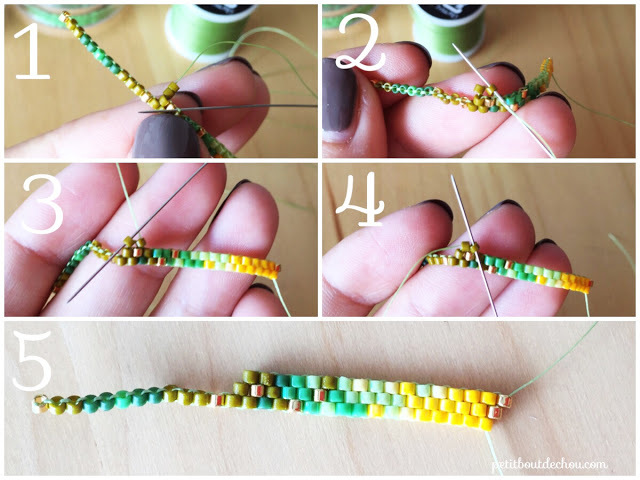 To do so, string on the first two beads of the row following the grid (1) and slide your needle between the first and the second bead of the previous row. Then, go through the second bead from bottom to top (2). Pull the thread (3). Your increase is done. 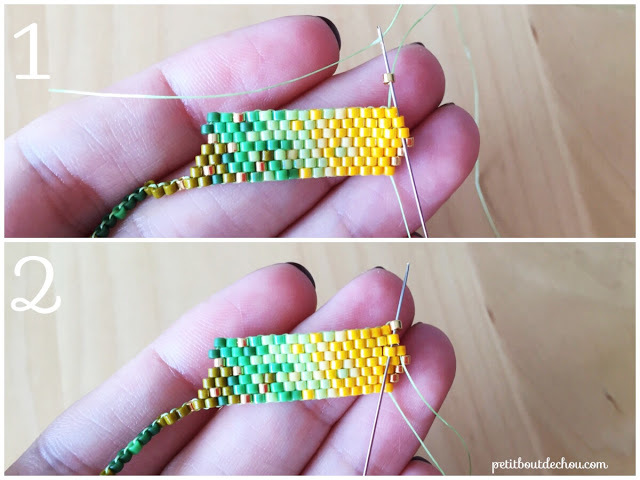 Start by stringing on the two first beads of this row following the pattern. 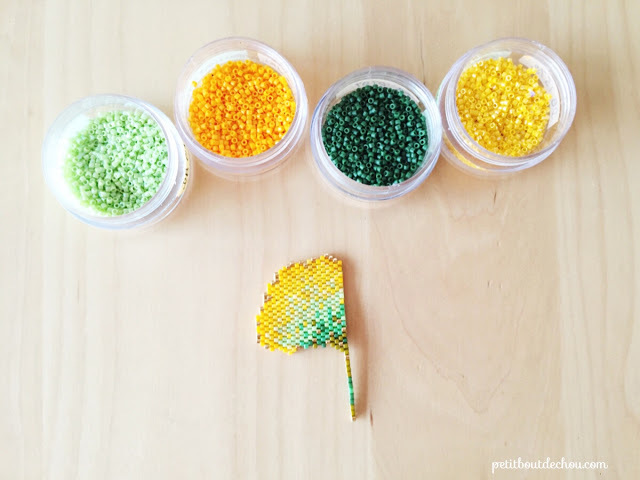 Then, slide the needle between the second and third beads of the previous row (1). 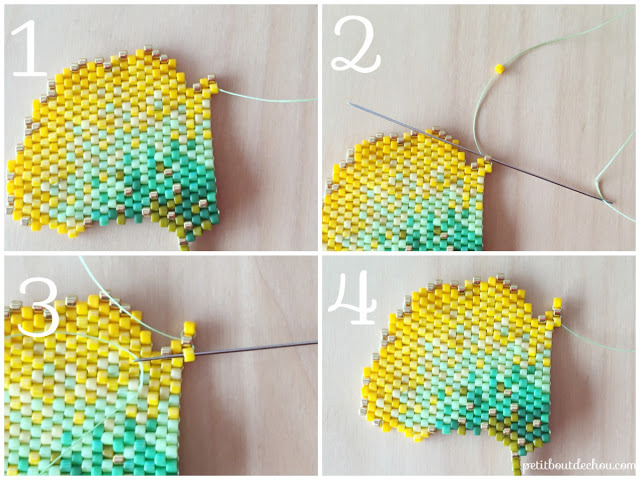 Pull the string fully and go through the second bead of the new row (2). 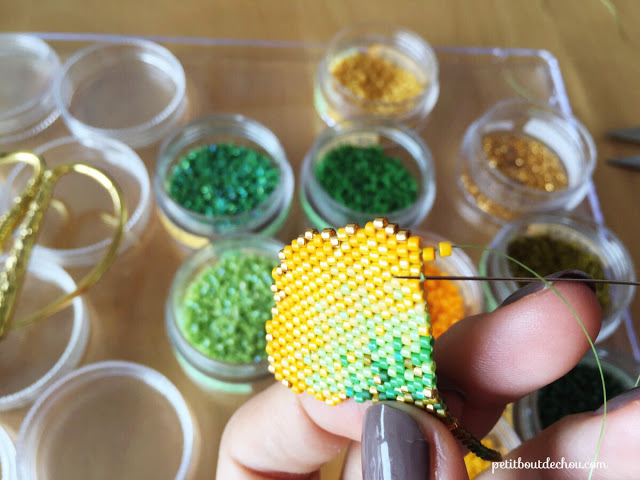 Go through the first bead of the row from top to bottom. Pull the string (3). Go through the second bead again from bottom to top. Pull the string (4). The first two beads should now be well positioned. You have done a decrease at the beginning of the row. Continue following the pattern using normal stitches until the end of the row (5). For the normal stitch, just string on a new bead and slide your needle between the two beads of the previous row located just below. Go through this bead and pull the string. You will also have to make increases at the end of the row. 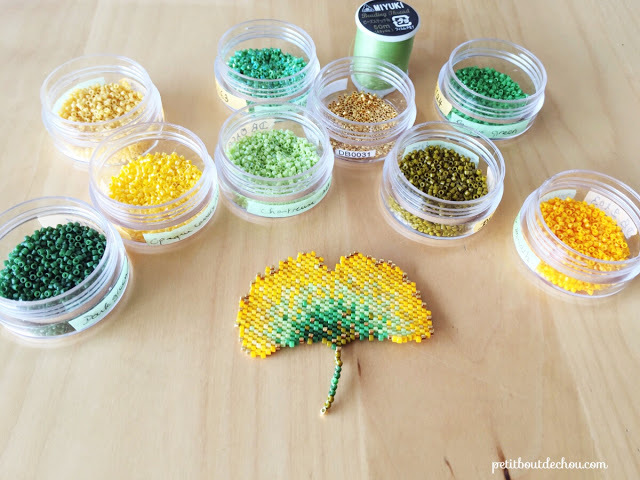 To do so string on one bead and go through the beads below on the two previous rows (1). Then, come back up by going through the bead next to it and the two previous ones (2). You have formed an “X” and you are back through your additional bead. Follow the pattern until you reach the end of the left half. The second half starts with a double decrease. It is the same as a simple decrease at the beginning of the row except that you need to weave through the beadwork so that your thread is going out of the second bead of the previous row instead of the first one. You will encounter a double increase in the second half. It is done by starting with a simple increase (1). Go through the first bead. 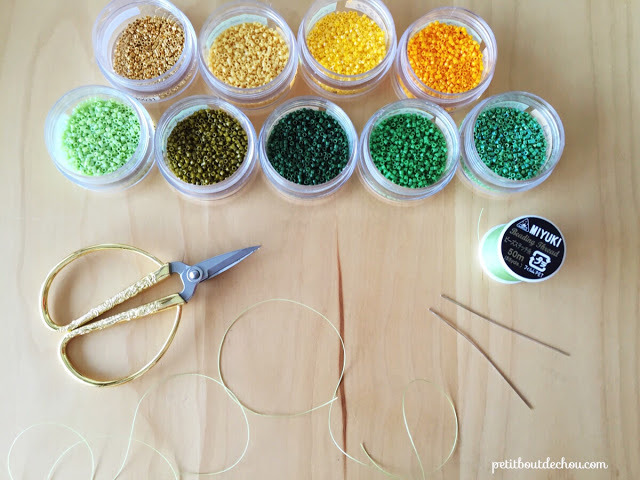 String on the additional bead and go through the first bead(2). Then, go through the second bead (3). Your multiple increase is done (4). Follow the grid until the end of the second half. 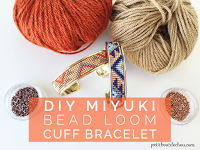 Hide your thread by weaving through the beadwork. 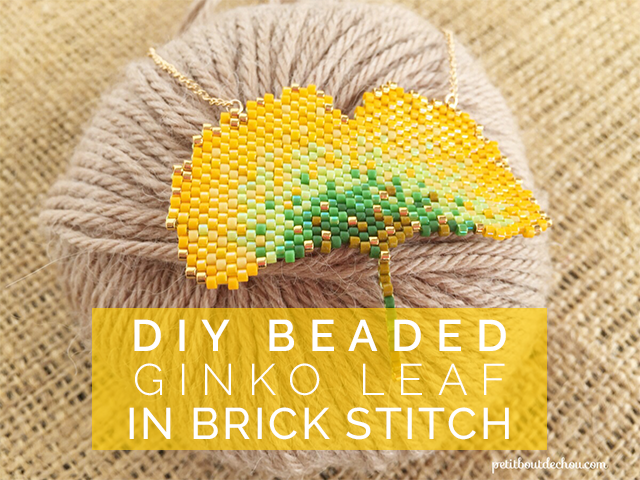 Use your pliers to open a jump ring and insert it in one of the top beads of your leaf. 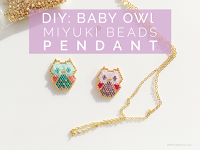 Insert the last ring of the chain cut in half in the ring too before closing it. Then, open a jump ring to link the chain and the end chain, close the ring. 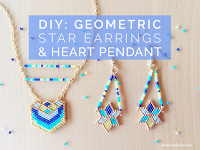 For the other side, repeat the operation to link the chain to the beadwork. Then, open a jump ring to link the chain and the clasp. Your necklace is done.